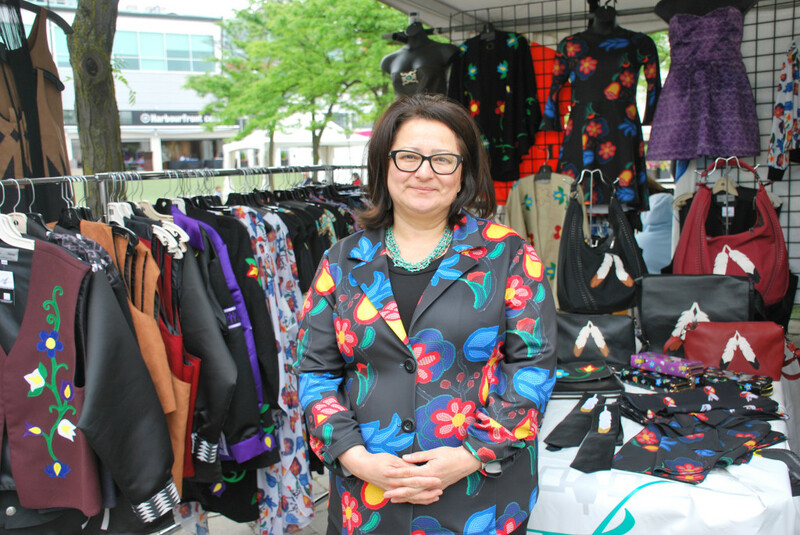 The Trade & Consumer Marketplace attracted dozens of Indigenous artists, crafters, and entrepreneurs, who brought with them their best work to the delight of the crowds at Indigenous Fashion Week Toronto. 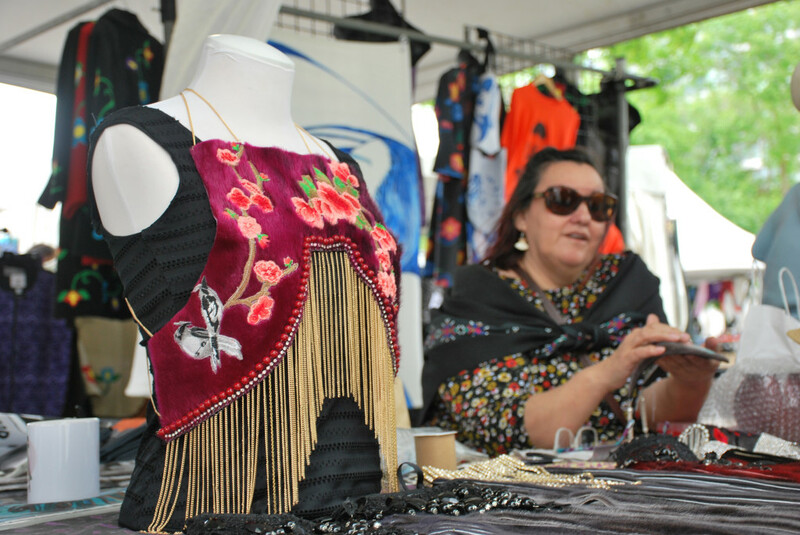 Harbourfront Centre’s Ann Tindal Park was brimming with vendor booths selling art, apparel, and accessories; many traditional, and many with a contemporary twist. 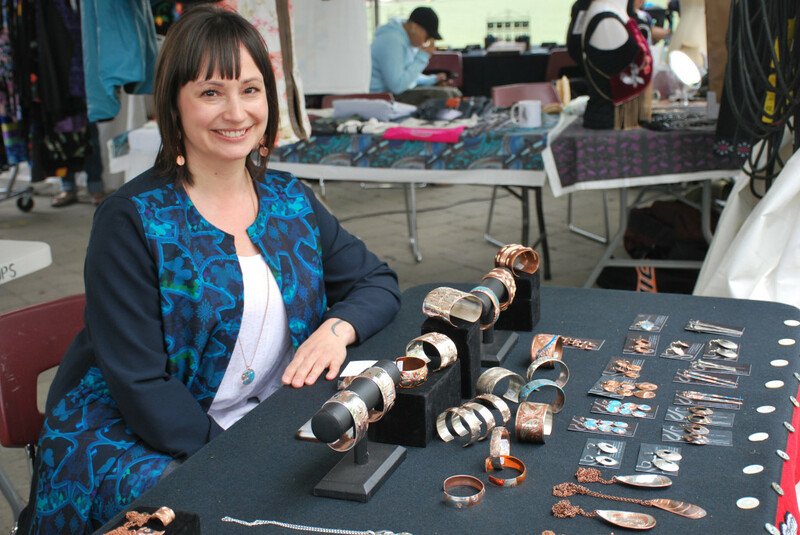 Jennifer Younger is a Tlingit artist who travelled all the way from Sitka, Alaska to sell her copper and silver jewelry at IFWTO. She got into the art of carving metal 6 years ago, at the suggestion of her sister, and has been doing it ever since. “Once I started, I fell in love with it. If I could do it 24/7 I would,” she says. Her work is more contemporary than other carvers, and she uses a lot of monogrammed ovoids, like this cuff bracelet, which takes about one day to make. “I do everything by hand, I do use a pneumatic engraver, so there’s a little bit of help there,” she says. But as far as bending metal, she does it all by hand. She also hand files the edges of smaller items like earrings and pendants, but uses a grinder on some of the bigger pieces. Martha Kyak is an Inuk artist from Pond Inlet, Nunavut, but she’s been teaching in Ottawa at Nunavut Sivuniksavut for the past 8 years. Some of her best-selling and most beautiful pieces are her long fringe sealskin necklaces. When Kyak lived up north, she’d sew parkas for her three children, which is typical in Nunavut because there aren’t many warm parkas available to buy. Her floral parka with black fur trim is inspired by 1920s fashion. The black, white, and red parka is inspired by the 1960s and has a retro look, but she made it her own. Kyak also makes shorter sealskin parkas as well as blazer-like jackets, to incorporate pieces that succeed in a more sporty, business casual look. Tammy Beauvais is a Mohawk designer from the community of Kahnawake. Beauvais considers herself a fashion entrepreneur, and has been designing clothing for the past twenty years. ‘My style is more professional wear. I design with the professional Indigenous person in mind,” says Beauvais.